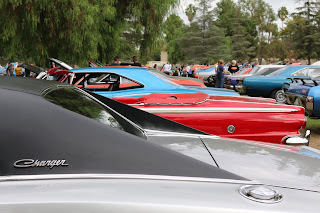 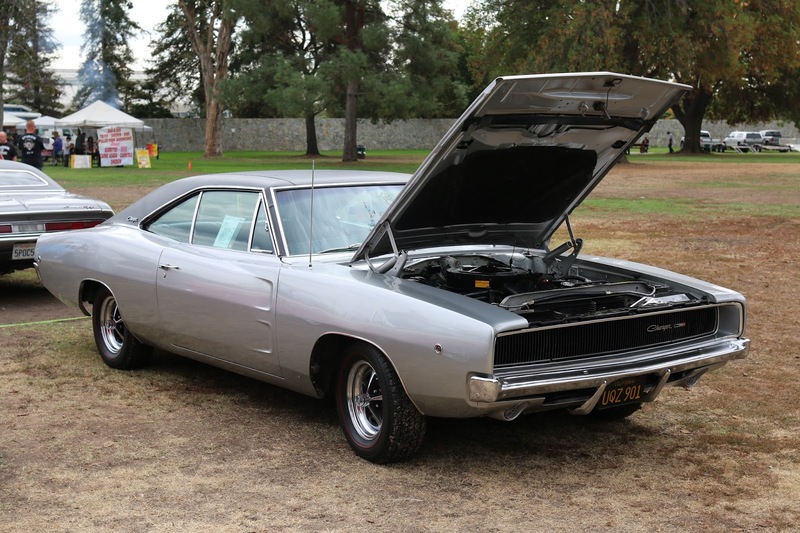 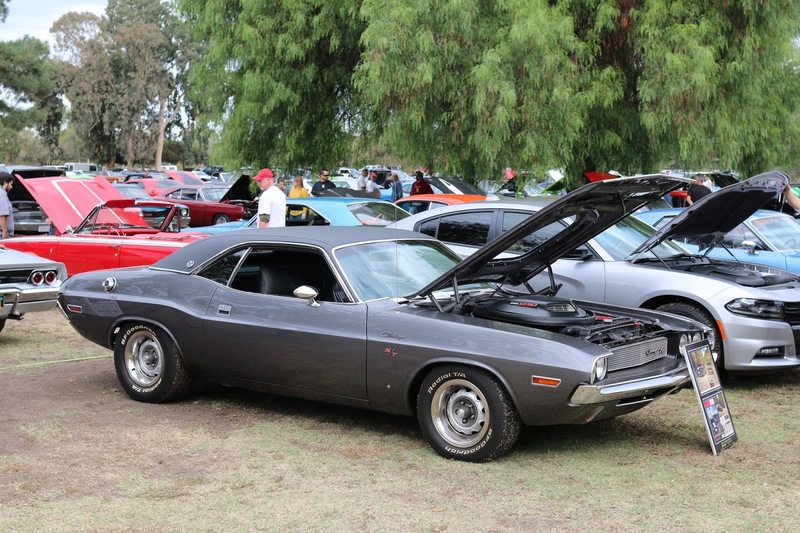 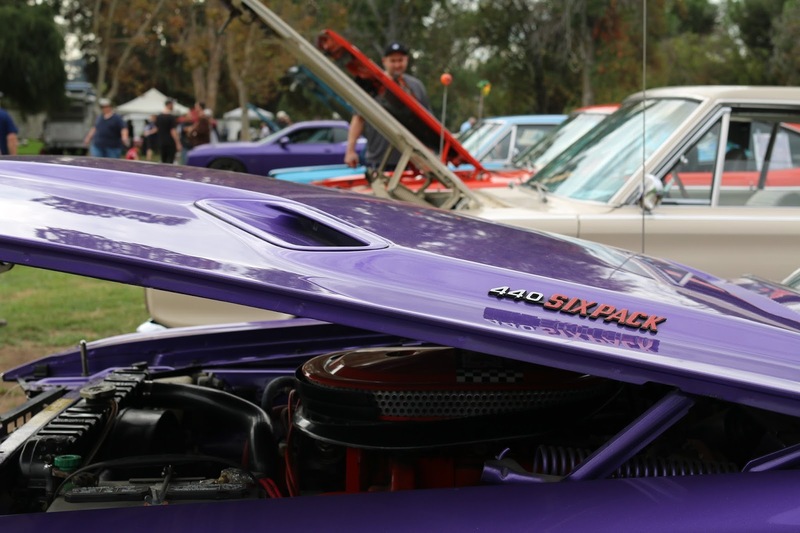 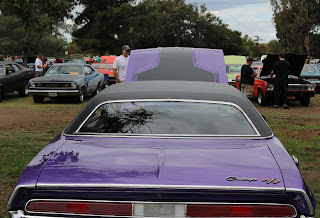 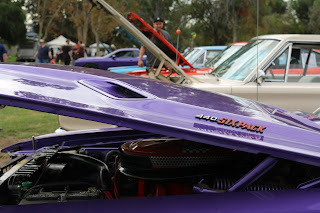 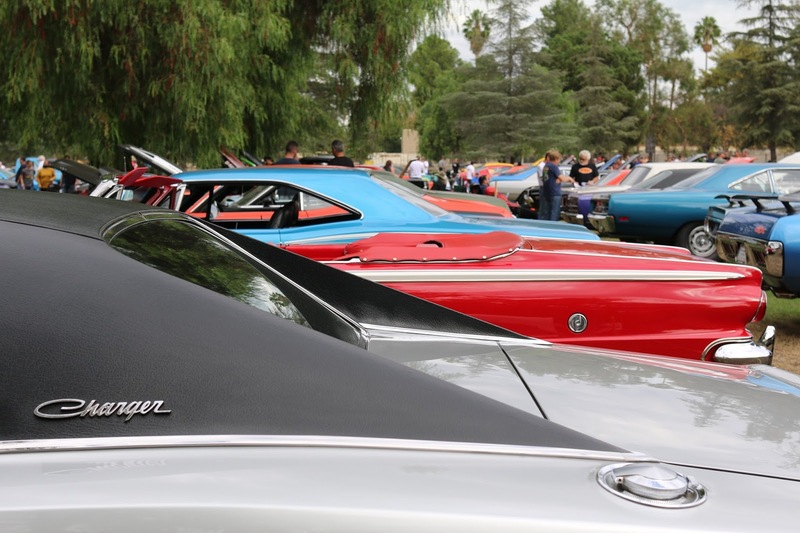 Saturday was our semi-annual visit to Woodley Park in Van Nuys, Ca for the Mopar Fall Fling. 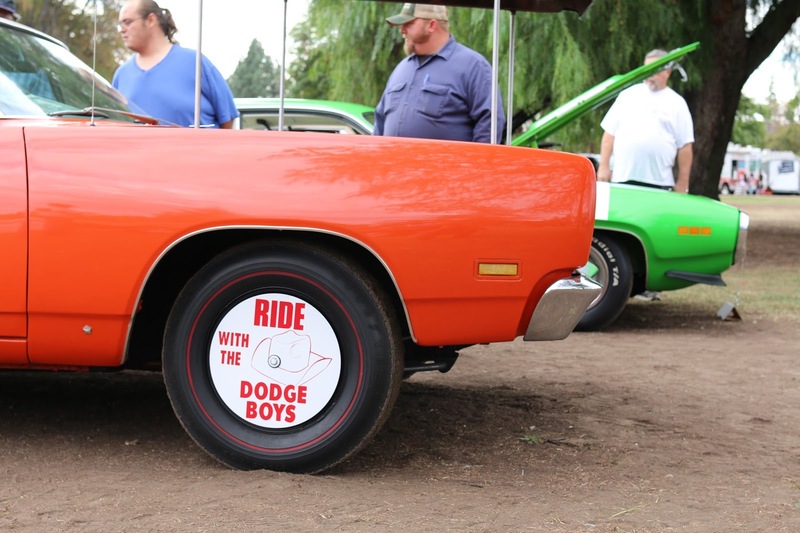 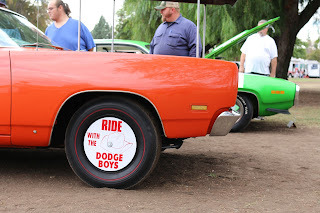 Our friends at Chrysler Performance West host this event each fall and it attracts Chrysler, Dodge and Plymouth enthusiasts from all over SoCal. 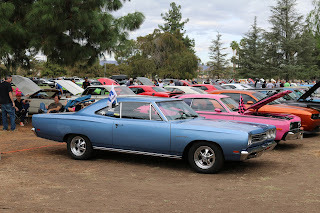 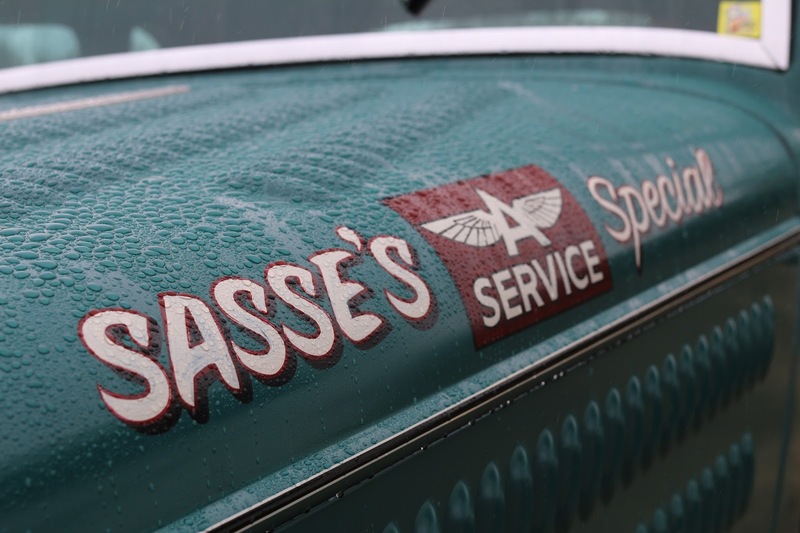 Poor weather over the weekend did damper the crowd and cars on Saturday, but the California Car Cover Crew still had a great time catching up with the Mopar enthusiasts. Here are a few photos we took during the Fall Fling. 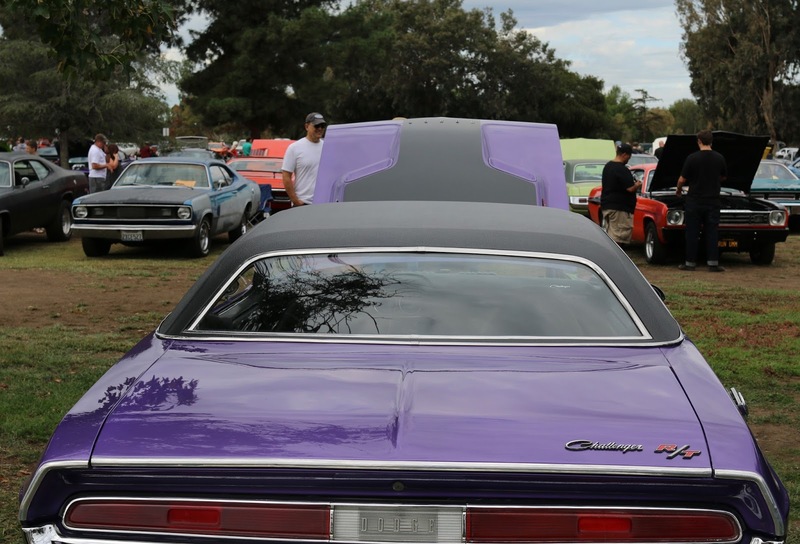 Check back with us next week with California Car Cover's post SEMA Show event coverage and more. 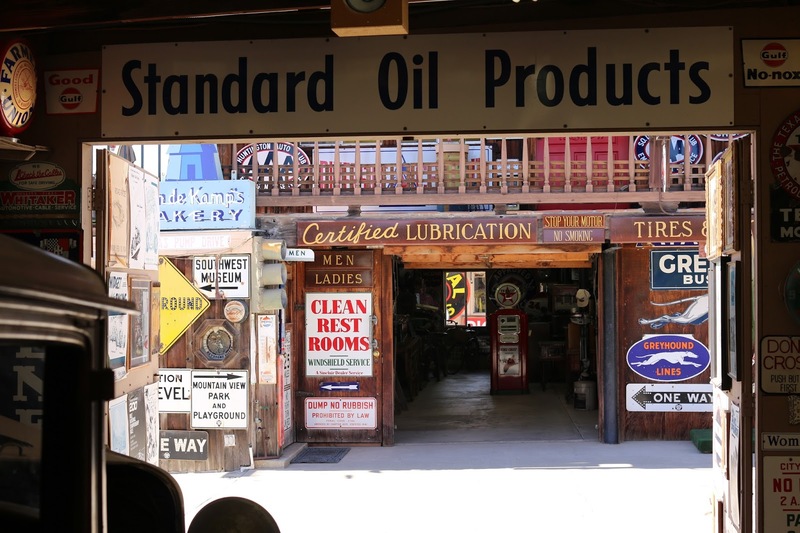 Next time you stop by Buellton for lunch at Ellen's or Andersen's Pea Soup, make sure to schedule an hour or two afterwards to walk through the Mendenhall Museum. 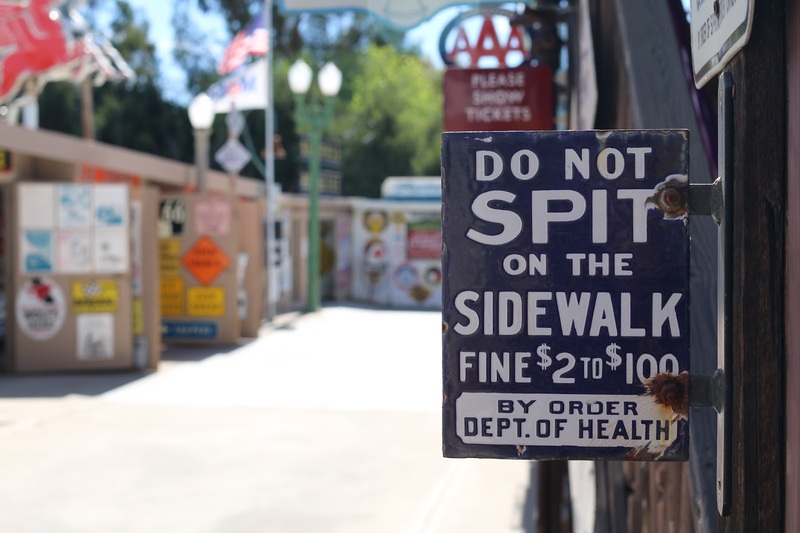 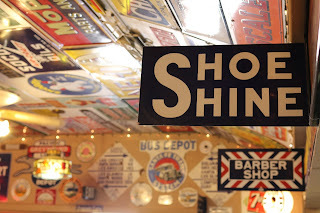 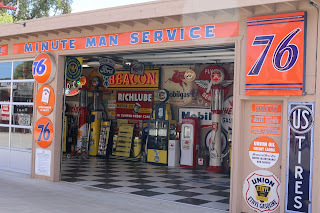 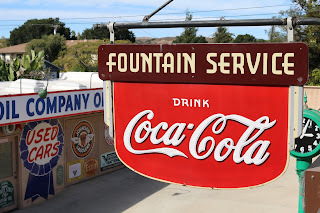 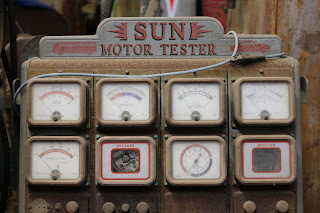 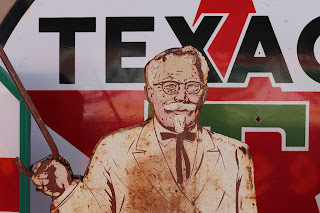 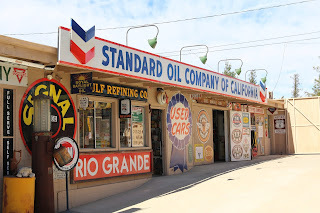 We took a visit to the musuem on a recent drive up the 101 and we thrilled with the experience. The museum is open to the public, you do need an advanced reservation to take a guided tour by the owner, Mark Mendenhall. Mark is a past customer of California Car Cover and we appreciated his time in giving us a tour of his family's museum. 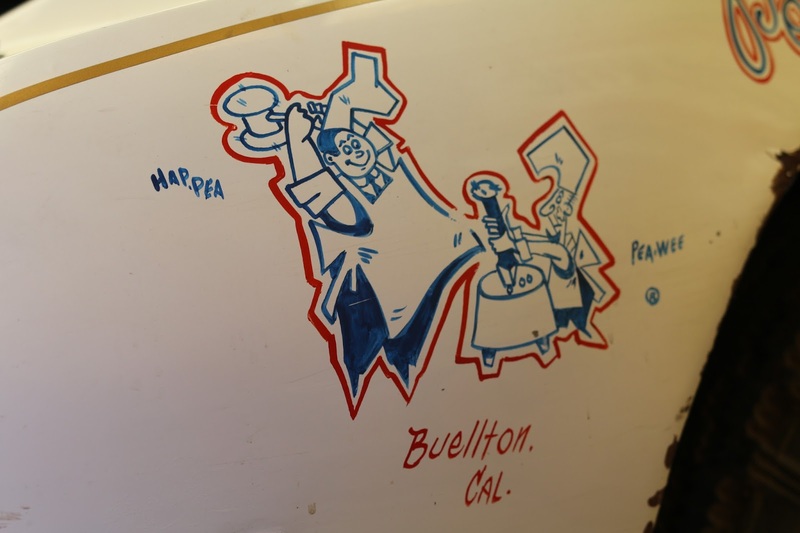 The Mendenhall family has been part of Buellton's history for many years. 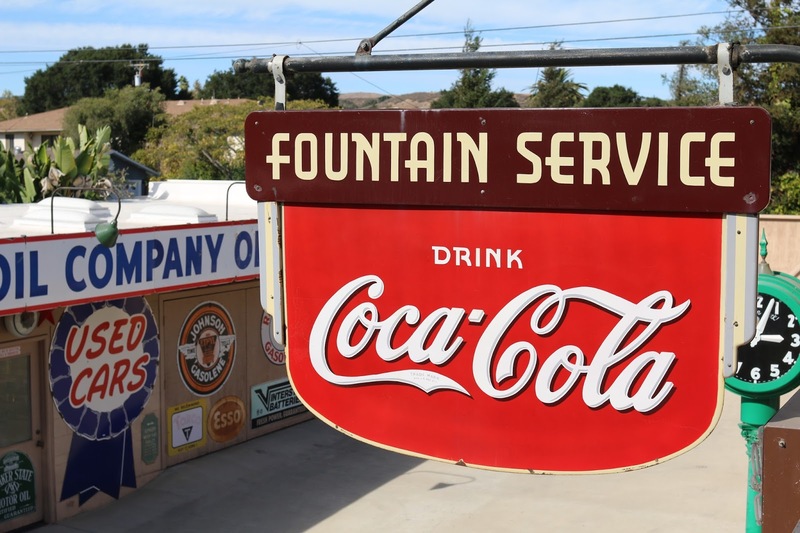 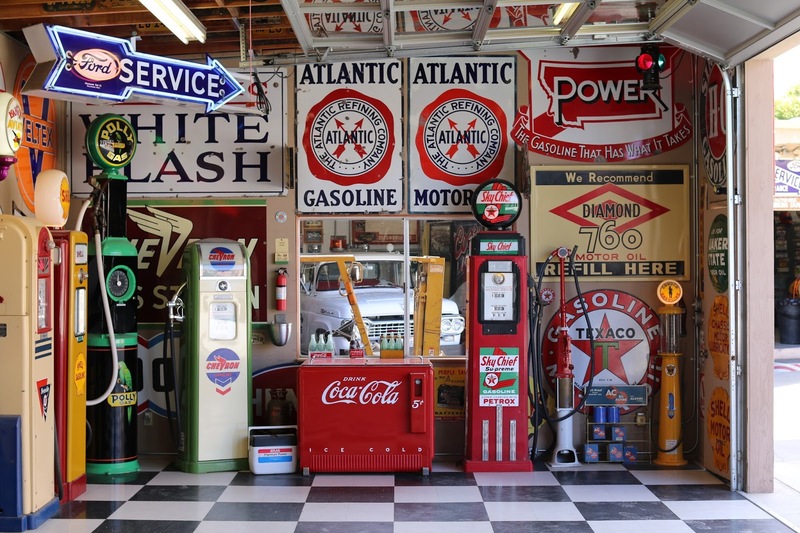 The family has operated service stations, repair shops and a wrecking yard in town. 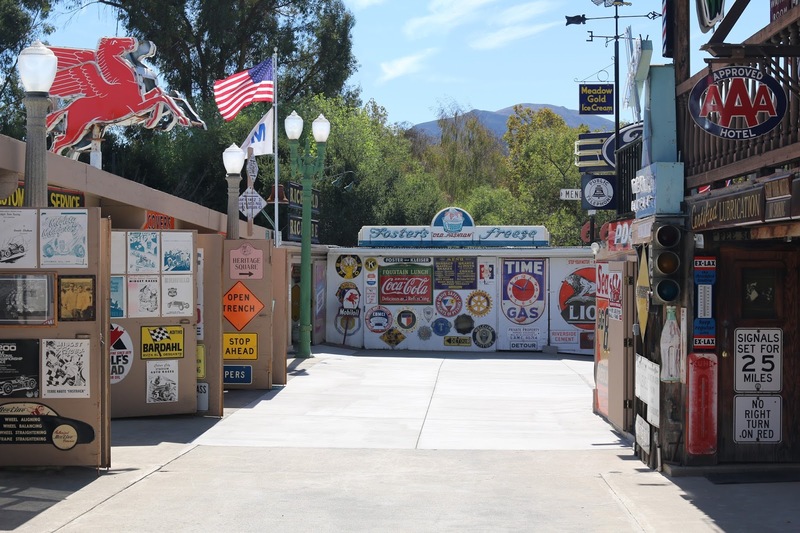 The site of the former wrecking yard is the museum. 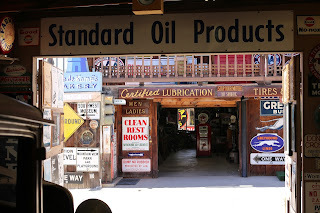 The museum was "started" by Mark's grandfather and his love of antique and picking. 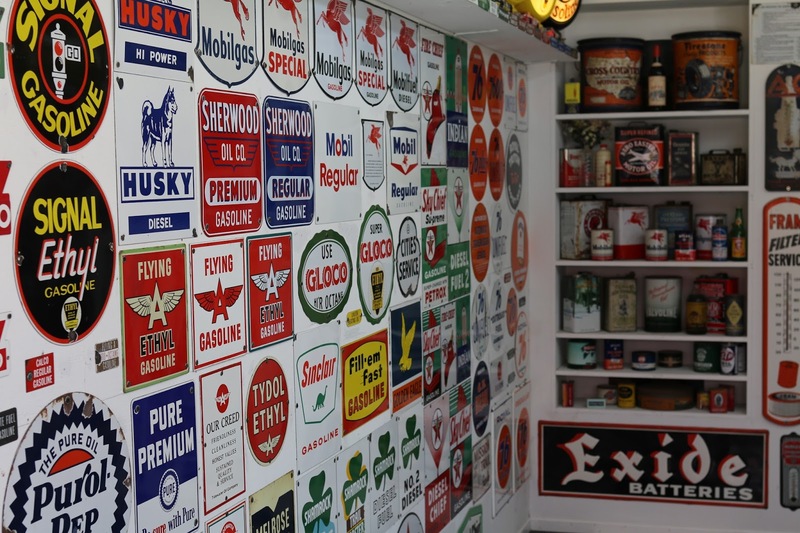 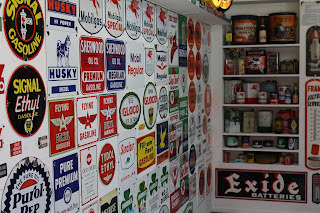 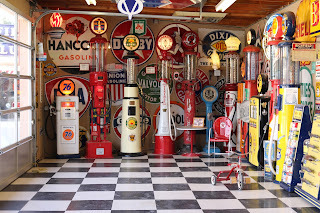 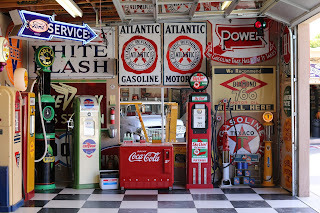 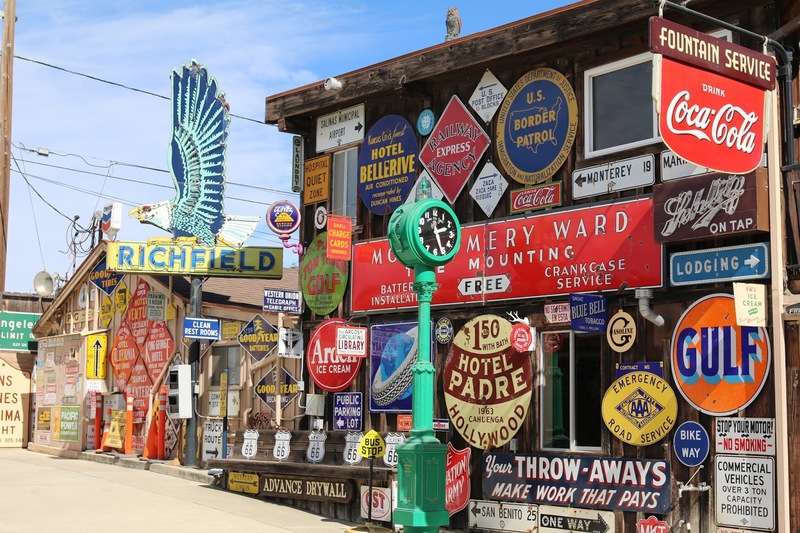 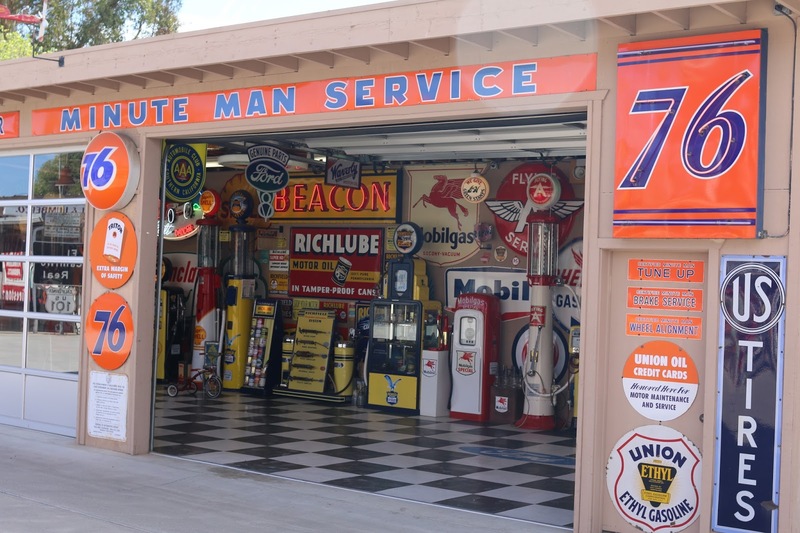 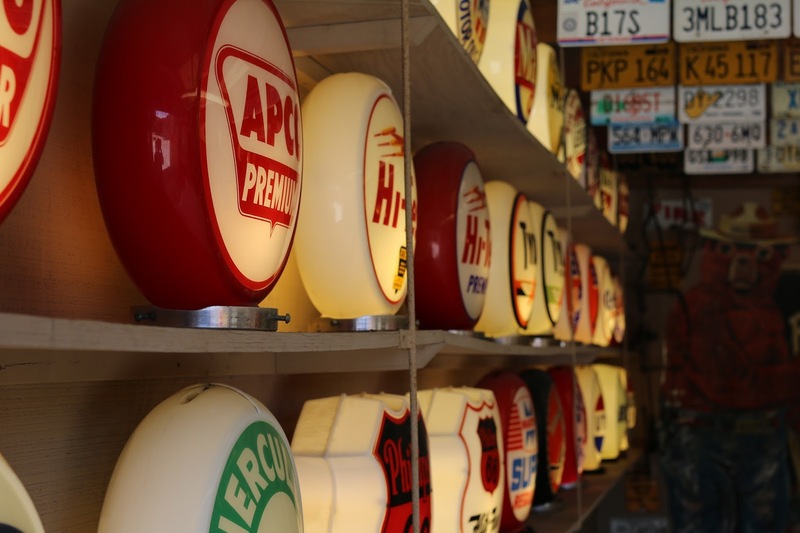 His large collection became part of Mark's father's collection and now Mark collects, restores and displays the automobilia. Just a few shelves of the many gas pump globes on display. 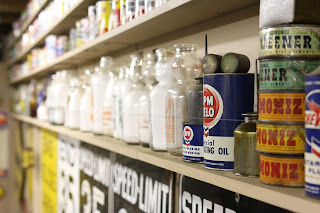 Just one of many pieces of shop equipment and unrestored gas pumps in the archives for future restoration or display. 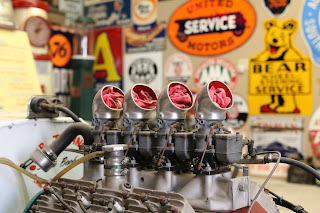 The museum is also a working garage for Mark's latest race car builds and restorations. 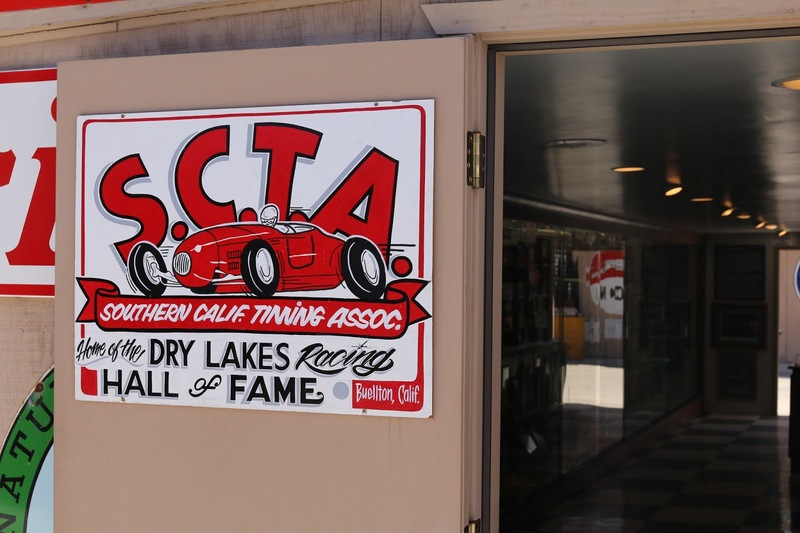 The Mendenhall Museum is home to the SCTA Dry Lakes Hall of Fame. 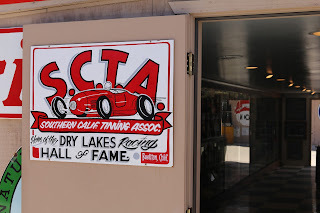 Each year the venue holds the annual hall of fame ceremony. 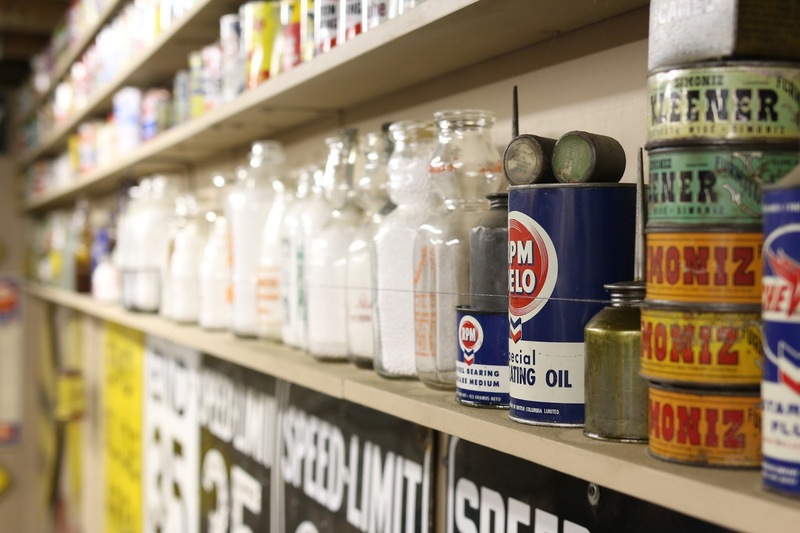 The museum has a large displays of racing memorabilia, trophies and photos. The museum has a number of vehicles from the Mendenhall family. 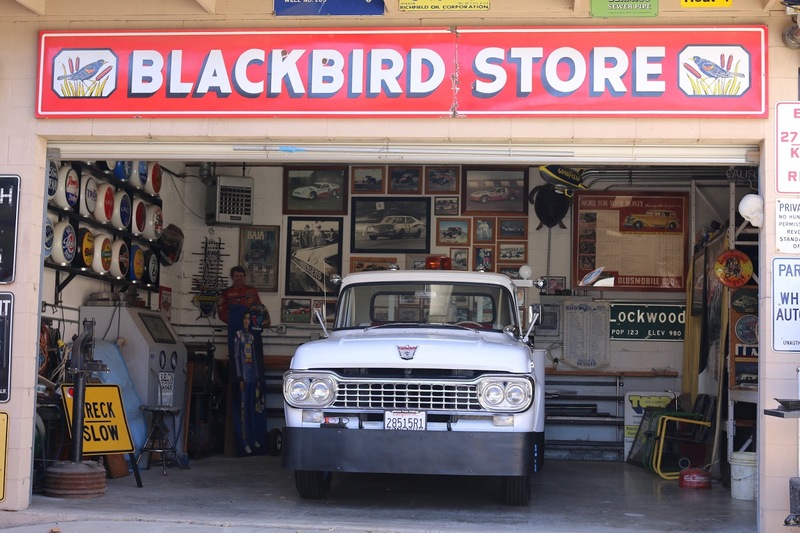 This is their classic GMC tow truck that was recently restored by Mark. 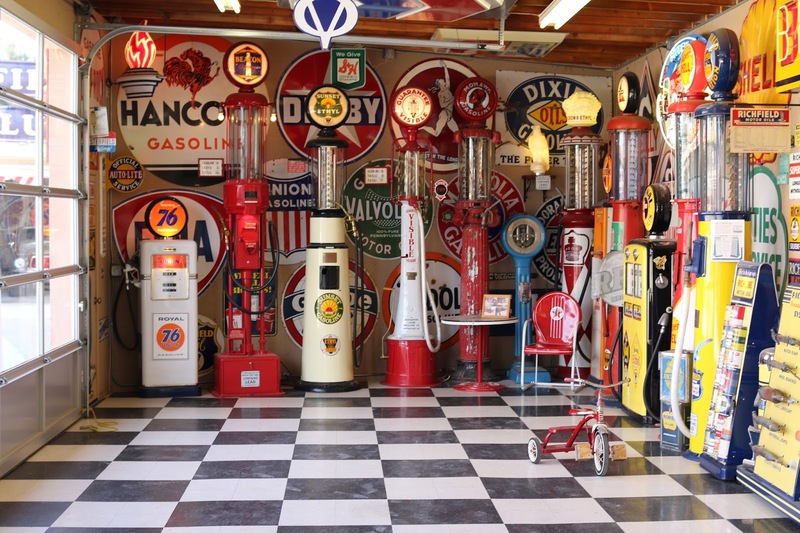 The Mendenhall Museum can be reserved for private events, parties and receptions. 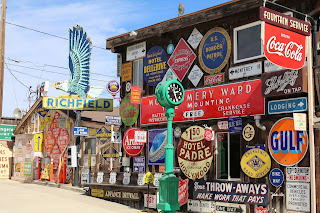 Feel free to contact the museum for tour availability when you are passing through town. 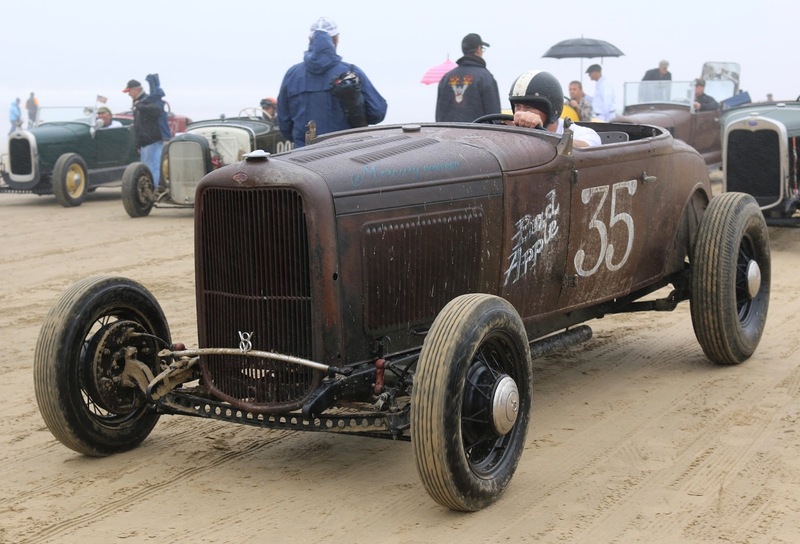 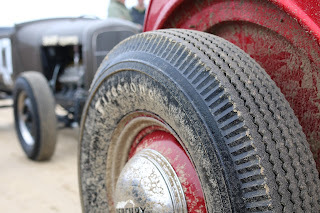 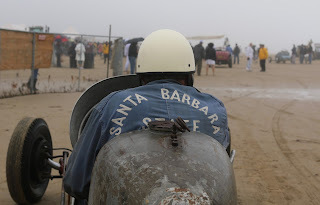 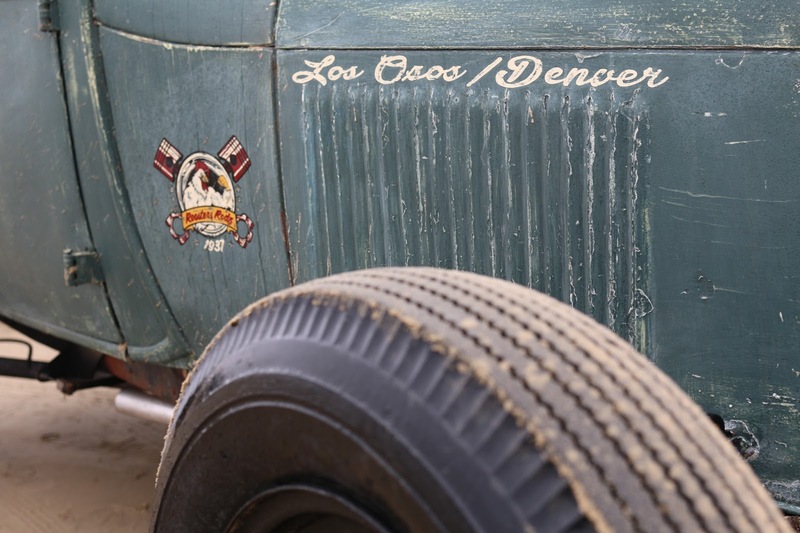 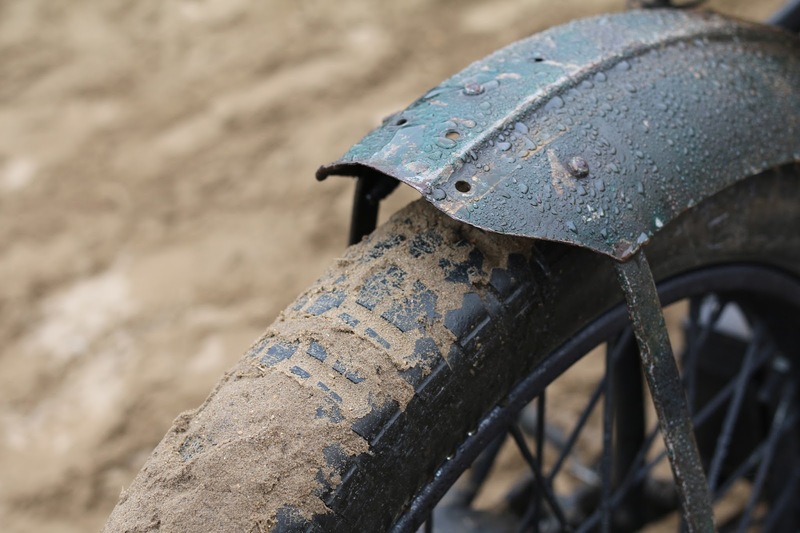 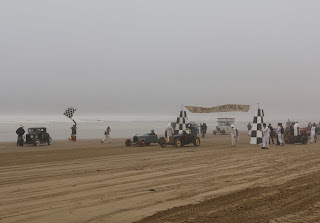 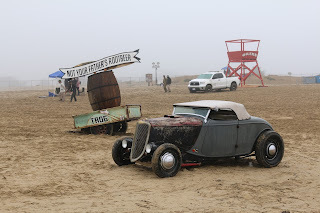 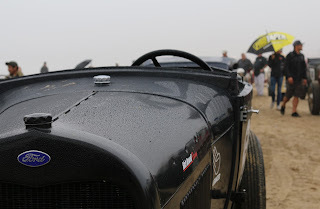 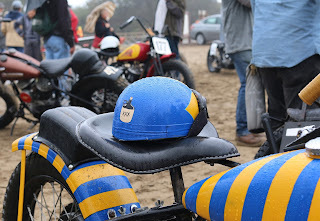 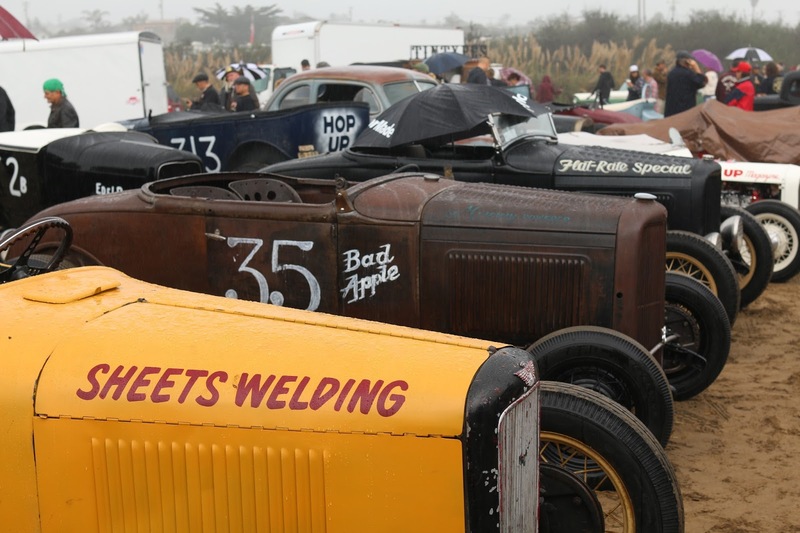 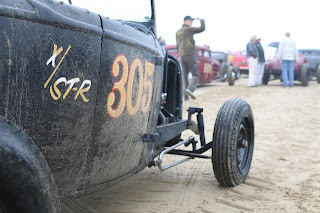 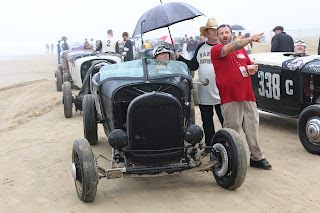 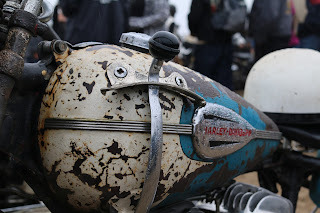 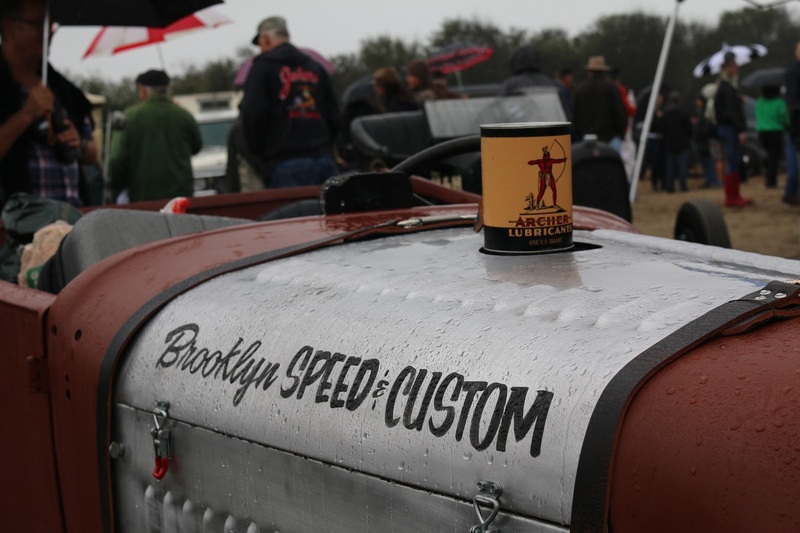 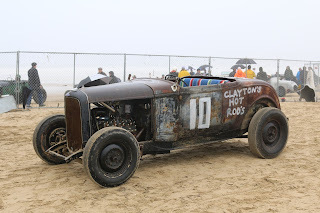 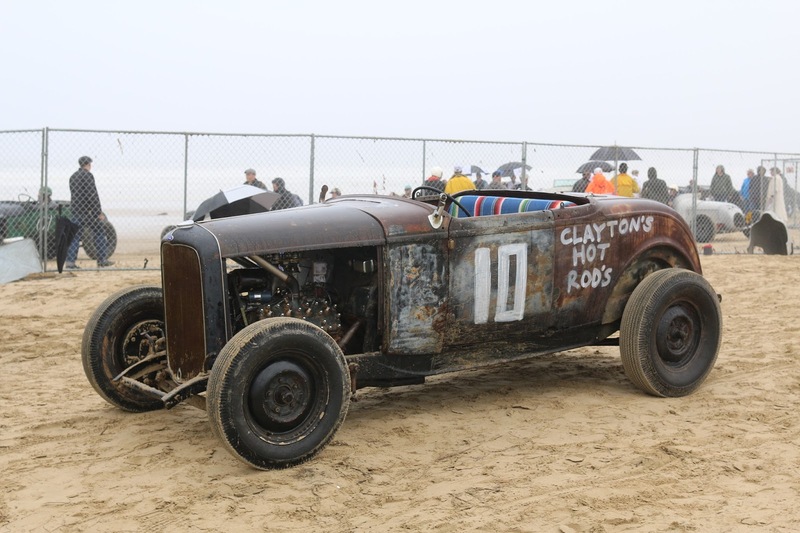 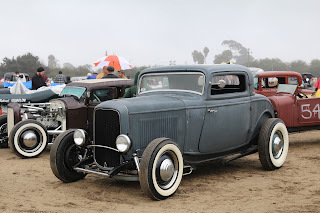 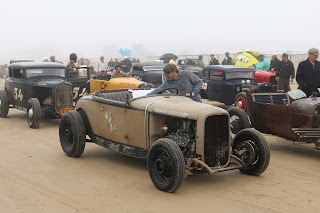 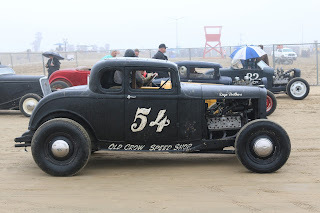 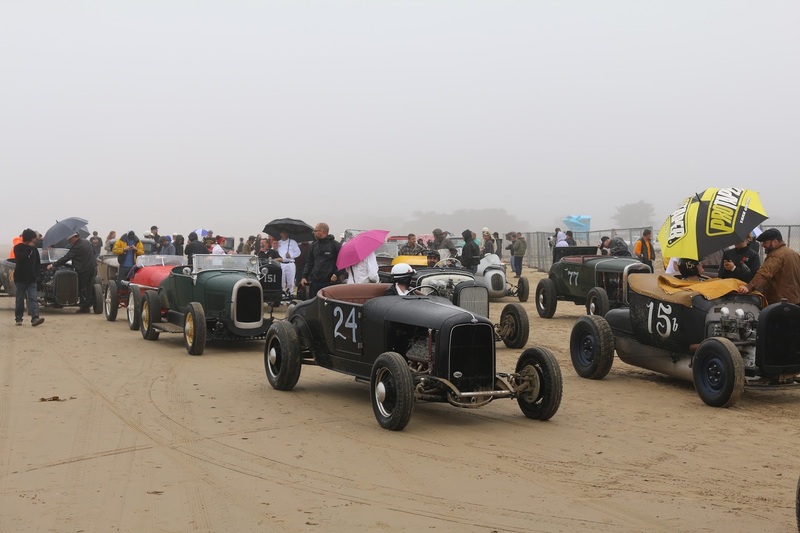 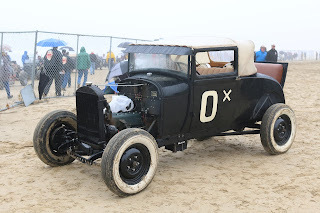 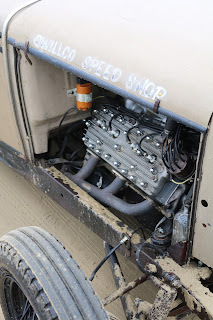 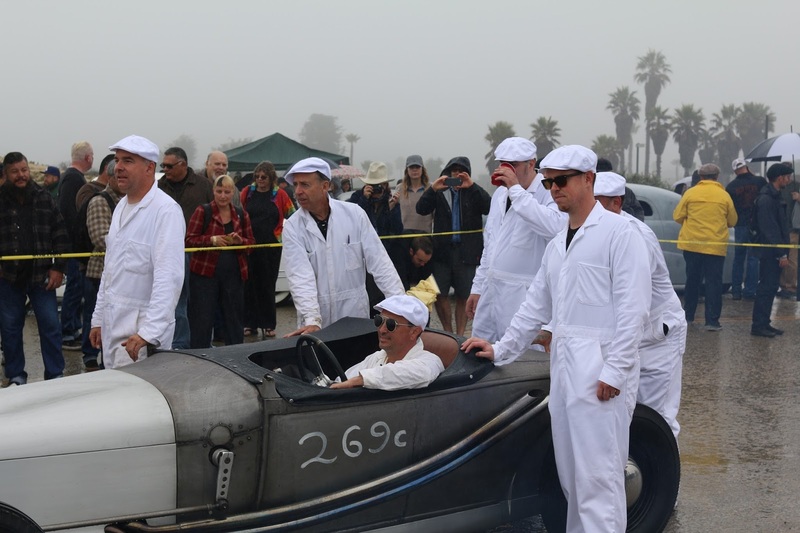 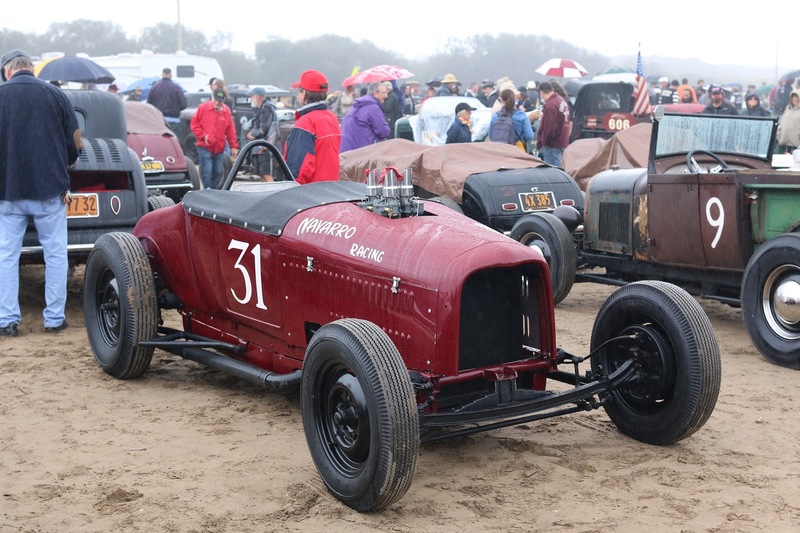 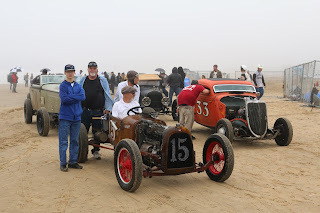 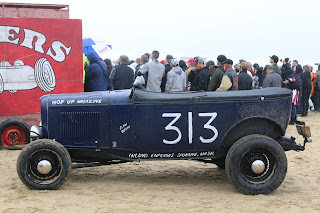 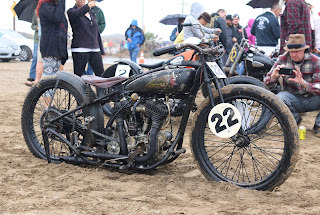 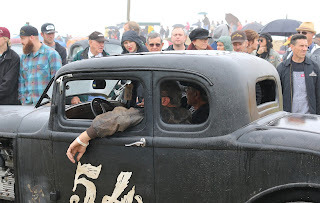 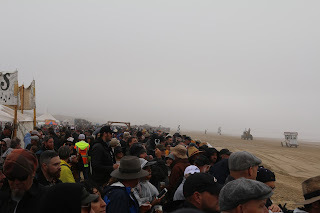 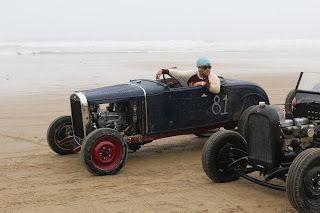 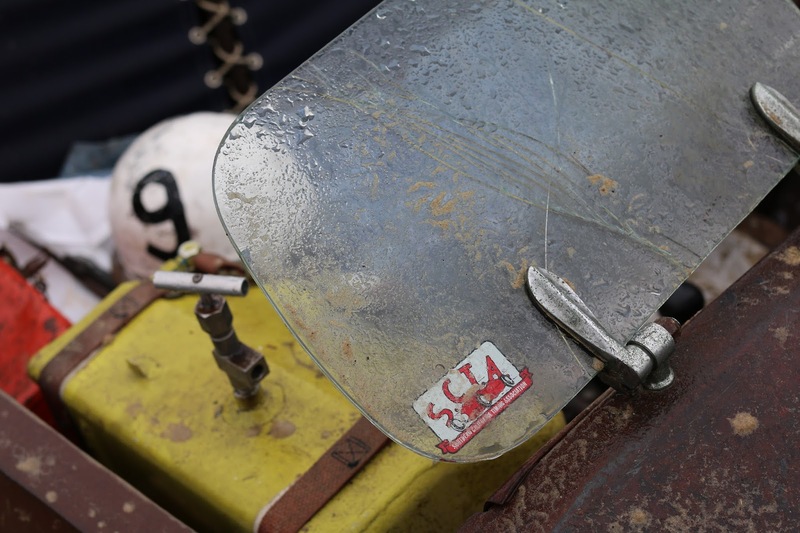 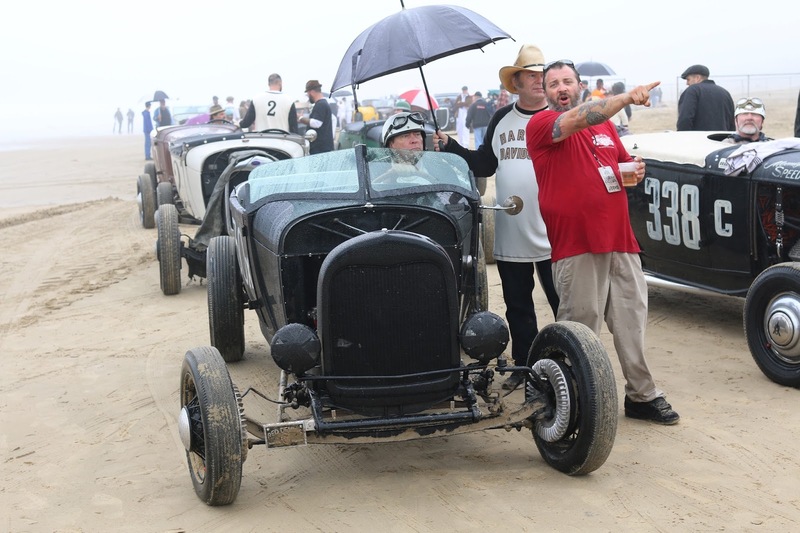 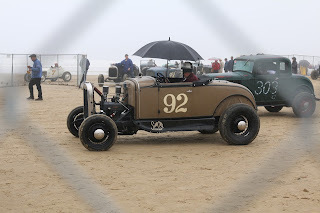 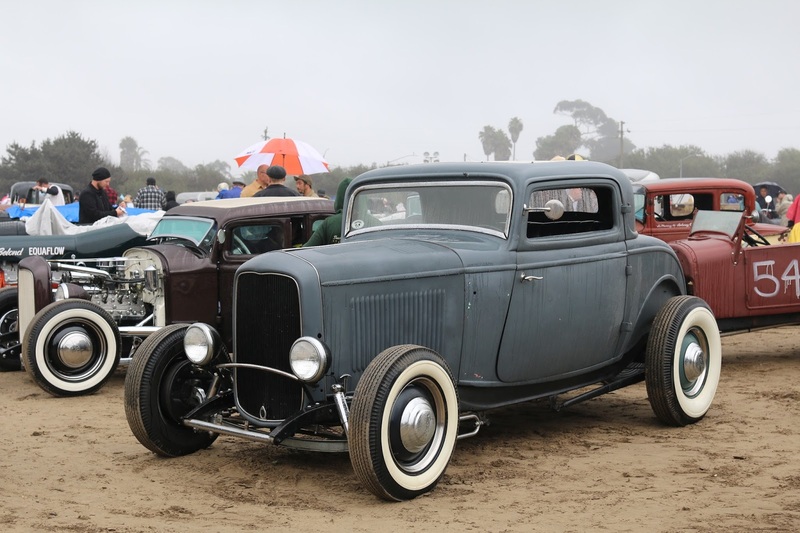 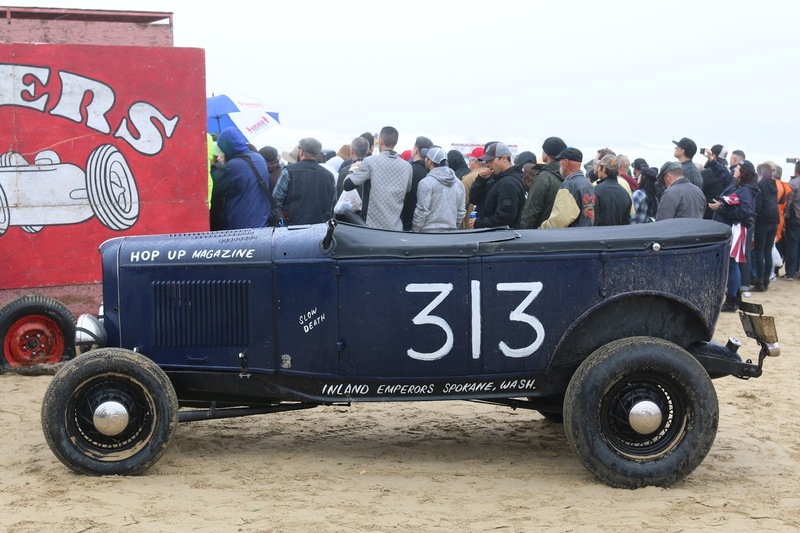 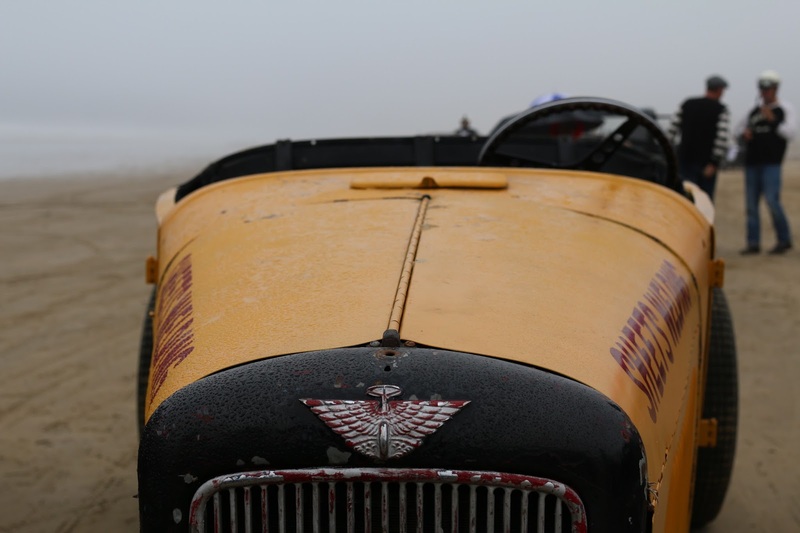 It was a wet and muddy weekend in Grover Beach, Ca for The Race of Gentlemen West, but that did not damper the spirits of the participants or attendees. 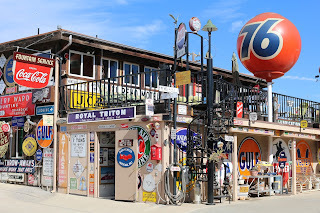 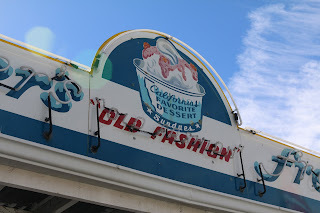 We cruised up to the Pismo Beach area for the activities on Saturday. 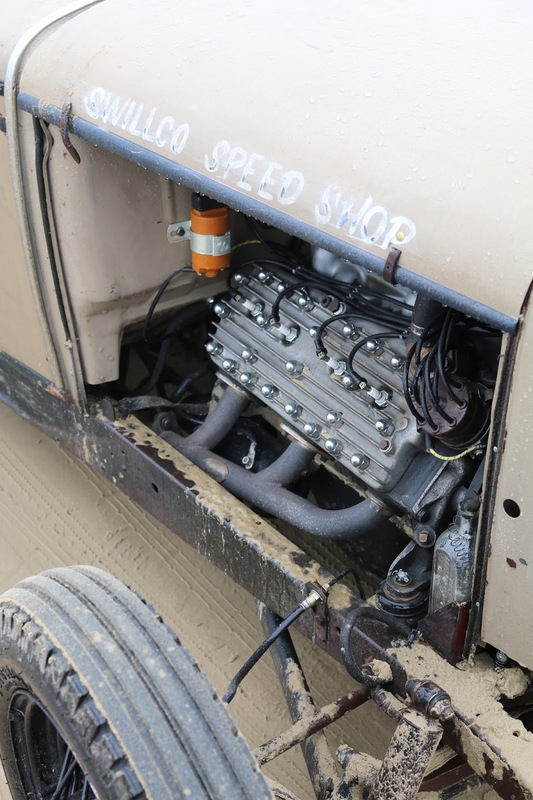 Many west coasts vintage car and motorcycle enthusiasts had been waiting for a few years for the TROG to make it our west. Even though some rain and high tides delayed or postponed much of the weekend, it was still a great time on the beach. 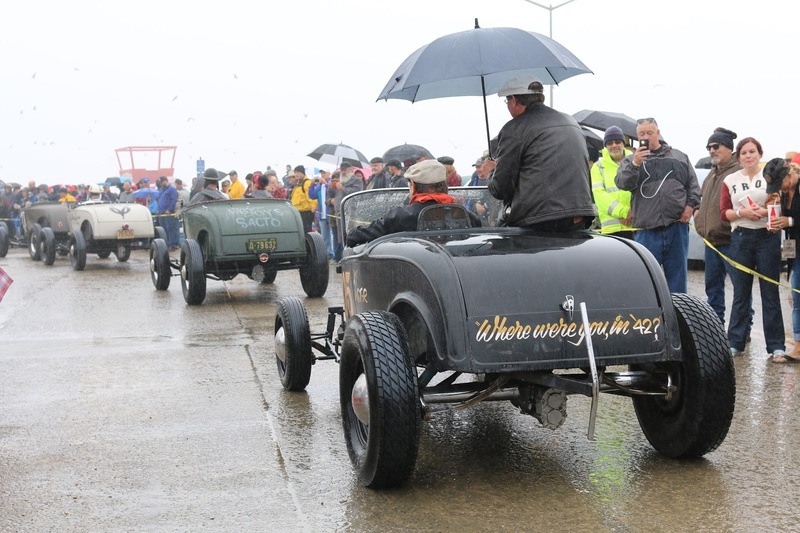 Abnormally high tides and wet weather delayed the start of racing on Saturday for a few hours. Even though it was wet, attendees packed the parking lots and eagerly waiting for racing. 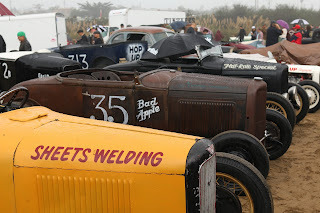 Everyone spent most of the morning in the parking lots near the venue, checking out the race cars and vintage autos. 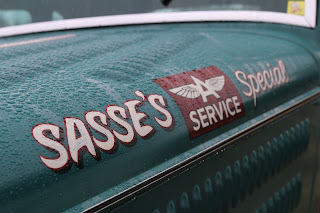 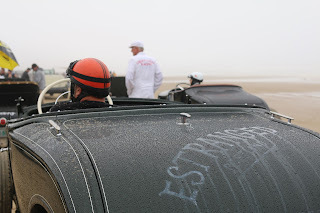 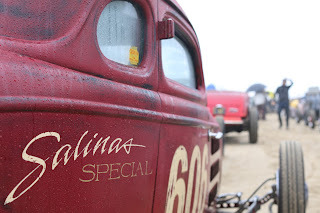 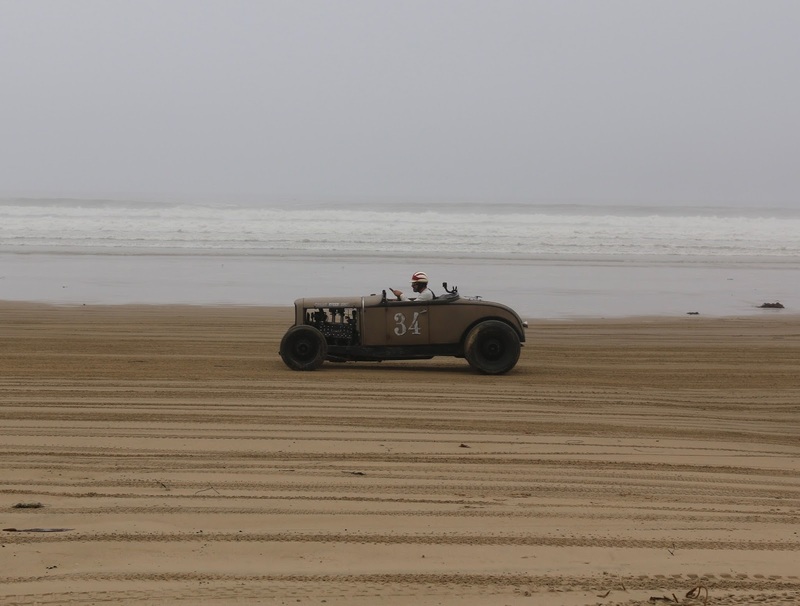 Even with the rain and mud, there were a number of custom vehicles on display as part of Customs by the Sea. 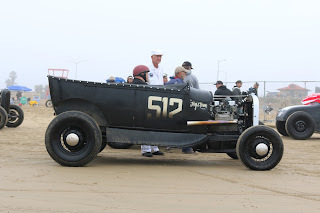 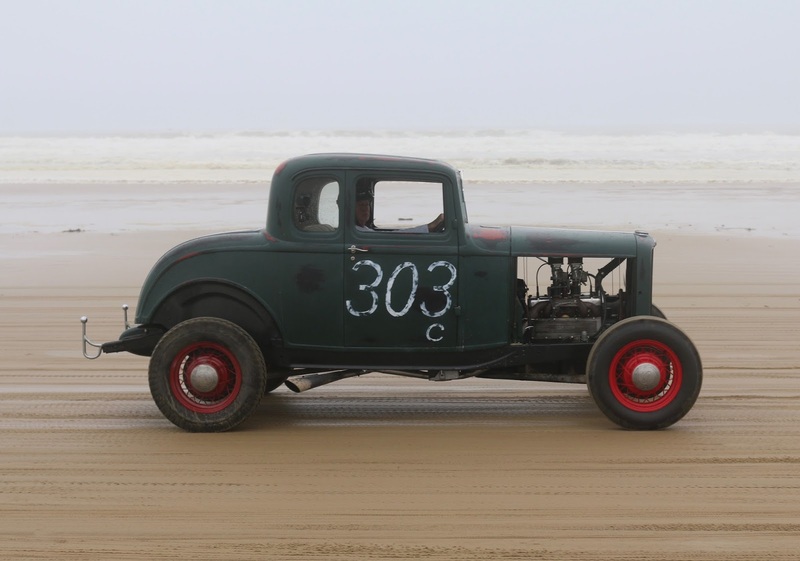 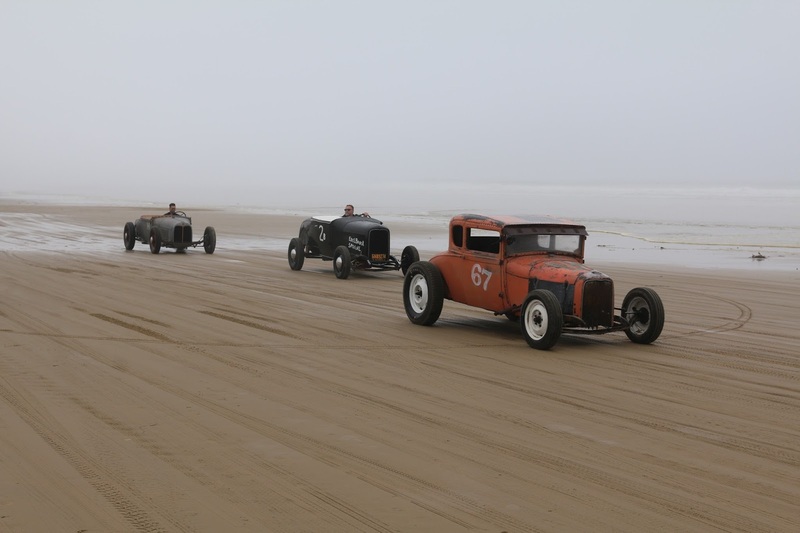 When participants were finally allowed to make their way to the beach pit area, the crowd gathered to watch the parade of hot rods and motorcycles. 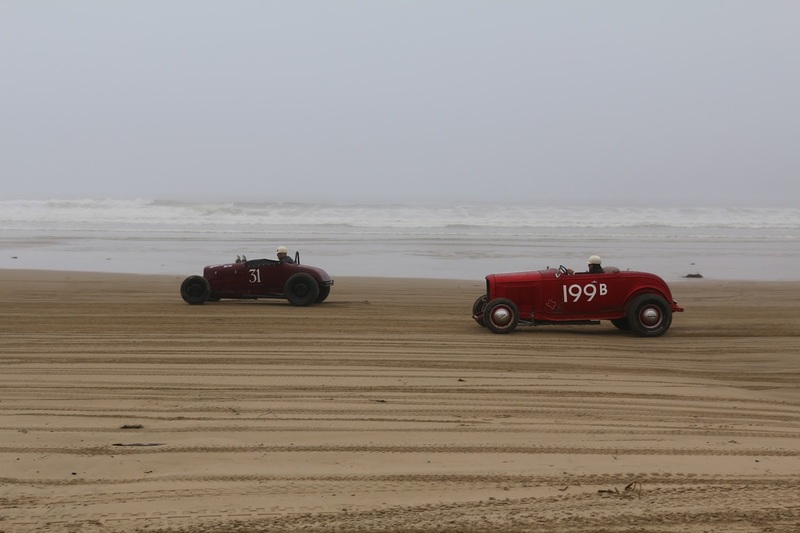 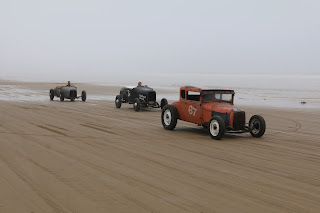 Racing action on the beach began in the early afternoon. 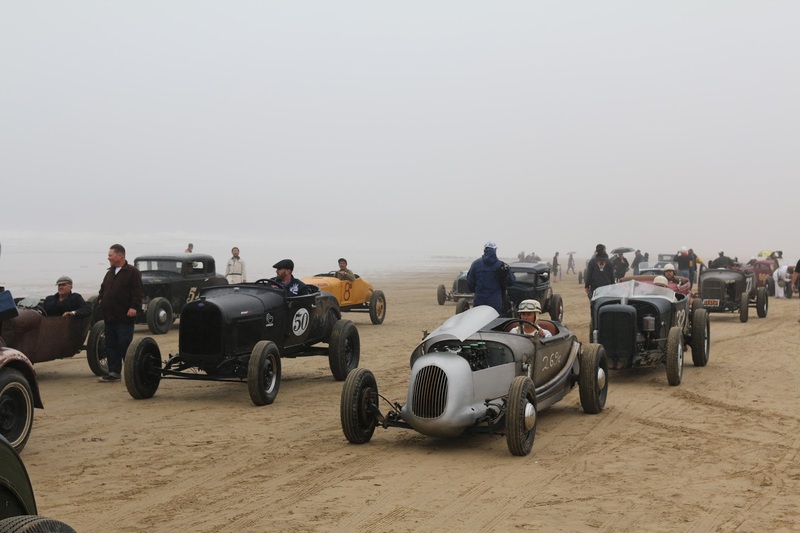 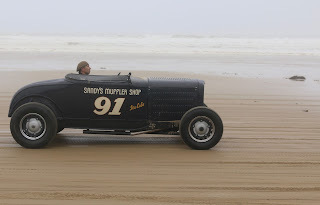 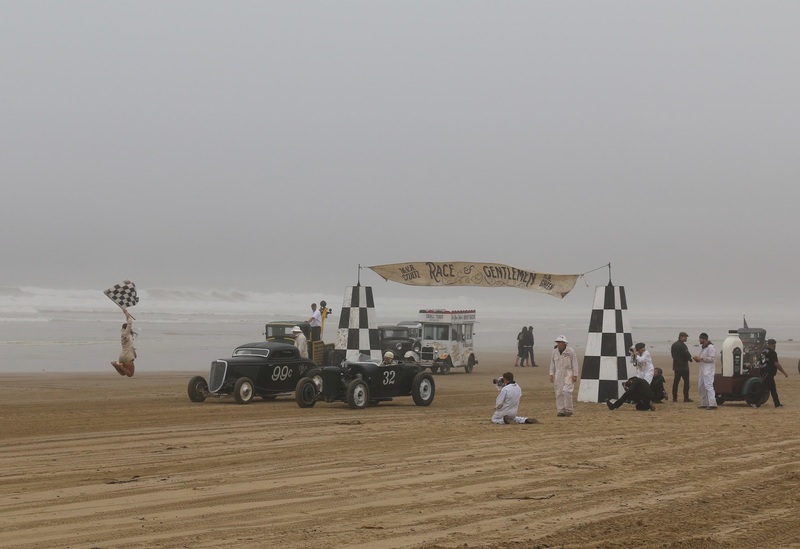 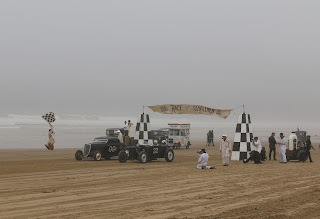 Thousands of spectators lined the fences to get a glimpse of vintage roadsters and motorcycles race down the beach. 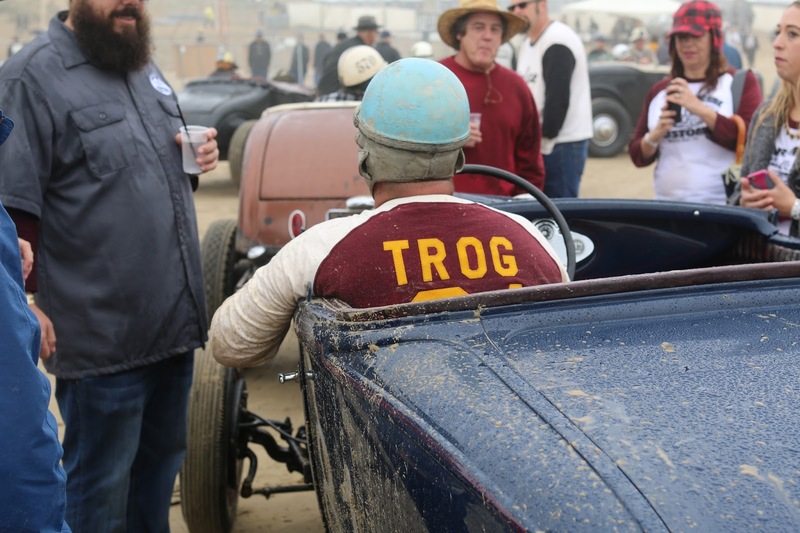 We had been to TROG in New Jersey back in 2014, so it was great to finally experience this event on the west coast. 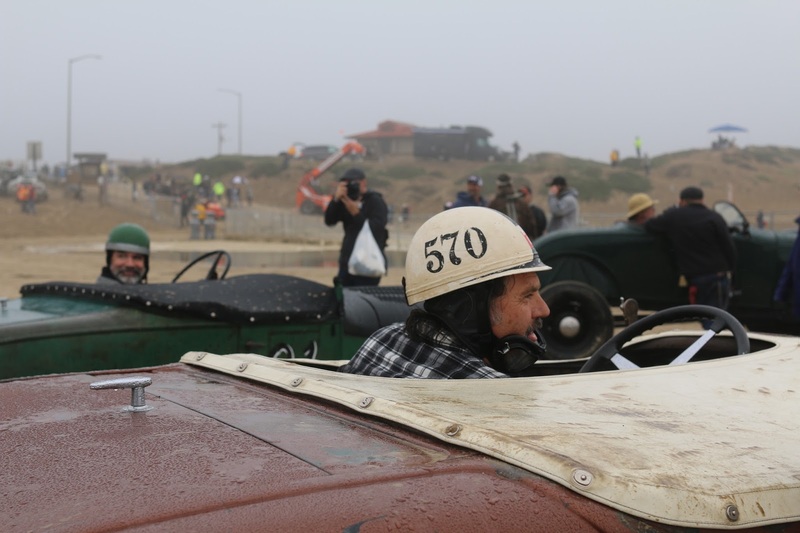 We aren't sure who this guy is and if he was yelling at us or not, but we love him anyway. The staging area was were participants and media correspondents could get an up close look at the race cars before ending the race area. 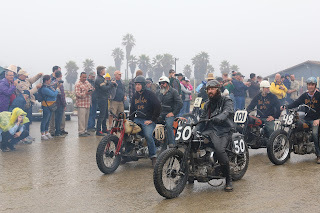 It is always neat to see the period correct roadsters and motorcycles up close. 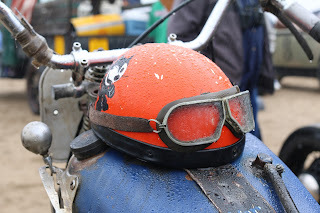 Unfortunately, most of the activities for Sunday were suspended due to the weather conditions, so we were happy to have attended on Saturday to see some racing action. 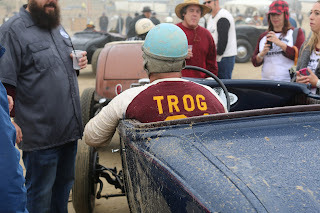 Thank you to everyone at TROG for hosting such a unique event and glad that we could attend this year. 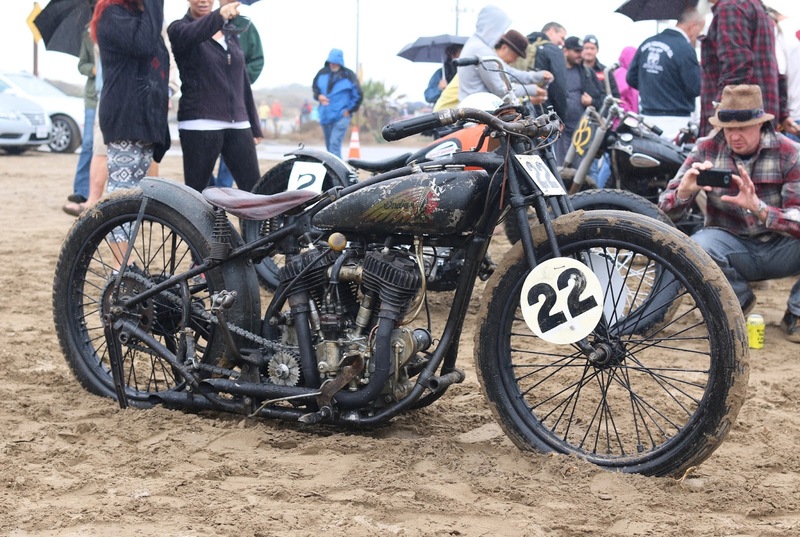 We look forward to the next Race of Gentlemen in 2017. 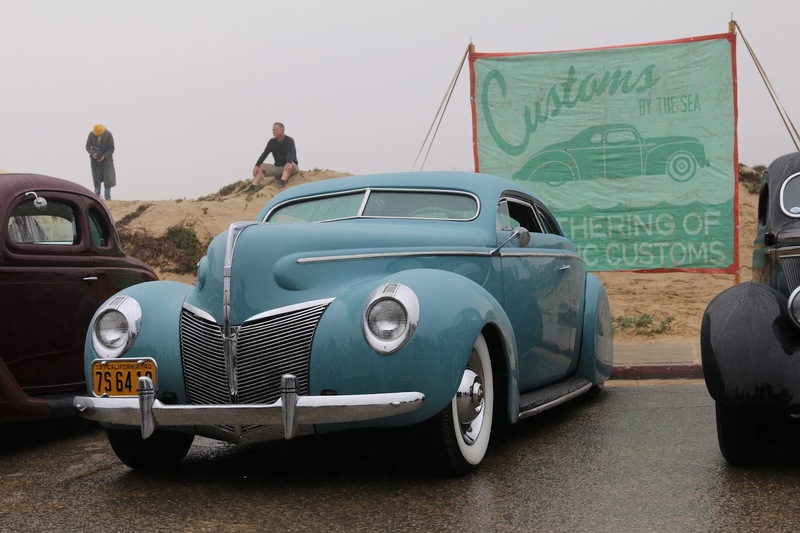 Keep tabs with where California Car Cover will be next on our Events Page.